Following yesterday’s (April 4, 2016) publication of the blog “ICNIRP did it again…“, I received today (April 5, 2016) message from Mike Repacholi, Chairman Emeritus of ICNIRP. With Mike’s permission I am posting his entire message with my responses and clarifications. List of persons “CC” in Mike’s message I covered, out of my own desire of preserving privacy. Leszczynski: No argument here. The members of the Main Commission of ICNIRP are experts, and so I said in the end of my post. What you describe is an ideal situation. As we well know, real life differs from the ideal. Furthermore, the only assurance of the fulfilment of these requirements is via self-policing. It has been shown in scientific studies that the self-policing does not work unless there is a possibility that some higher authority may check whether indeed all requirements are met and the self-policing works. Without such overlook, self-policing does not work, no matter what ICNIRP says. As I said in my post “…ICNIRP consensus” is not the scientific consensus…” ICNIRP’s avoidance of real scientific debate leads to problems – dissatisfied scientists and citizens go to politicians and courts. I can reverse your question and ask “why it is that ICNIRP just doesn’t get it”. Leszczynski: Here is a problem. Every expert has opinion. With this opinion he/she comes to work in expert committee. This applies to ICNIRP members too. I hope you are not suggesting that only the scientists of the Main Commission of ICNIRP are able to leave their opinions behind and evaluate the science for its merits alone. However, there is difference between the committee where work scientists with diverse opinions and with the committee where work scientists with very similar opinions. Scientists are humans and act as humans, with all ballasting baggage of pre-existing feelings and opinions. It is certain that the absolute “forgetting” of the pre-appointment opinions is not possible. Thus, scientists with no-effect opinion will easier accept no-effect studies and will look more closely for shortcomings in yes-effect studies. And the same will happen with the scientists having yes-effect opinion. They will easier accept studies showing yes-effect and look more closely for shortcomings in no-effect studies. Here is the problem. If all members of the Main Commission are of the same opinion, the scientific debate will be limited and likely skewed. 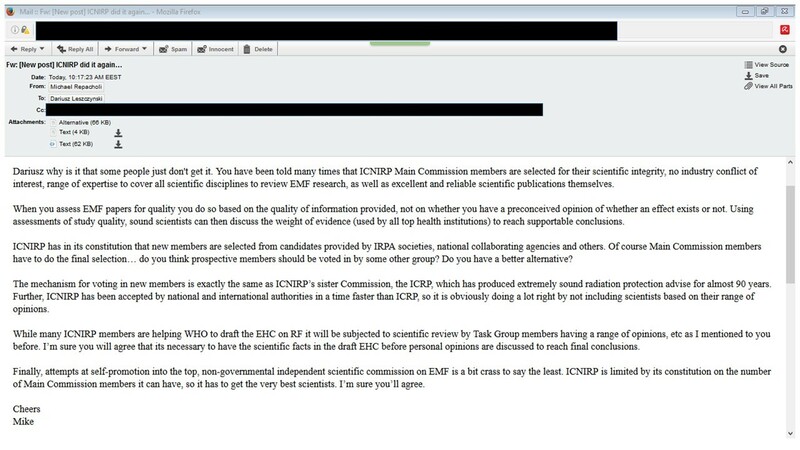 In my post I referred to IARC 2011 and included list of names of scientists not as a “self-promoting gig” but to demonstrate that out there are credible scientists with diverse opinions who can be engaged to enhance the quality and versatility of the scientific debate in ICNIRP and in EHC Task group – “why it is that ICNIRP just doesn’t get it”. Leszczynski: A better alternative should be found for both, proposing the new members and for the approval of the qualified members. Self-policing exercised by ICNIRP does not work. Studies have shown that if there is no any, potentially interfering and intervening, supervision, the self-policing does not work. Without supervision there is a danger that the self-policing will turn even the best constitution into a cronyism, the good fellas system. This is not a good outcome for the evaluation of science- “why it is that ICNIRP just doesn’t get it”. Leszczynski: Scientists with the same opinions cannot be called “including scientists based on their range of opinions”. If they all have the same opinion then there is no “range of opinions”. The lack of the range of opinions is the ICNIRP’s problem – “why it is that ICNIRP just doesn’t get it”. Leszczynski: The draft of the Environmental Health criteria was very one-sided in presenting science. However, indeed, it was only a draft. Now it will be see how the Task Group will be composed and how diverse opinions (pre-appointment) will be there. Of course, all Task Group members will be expected to leave their “old” opinions and look with “fresh eye” on the evidence presented in EHC draft and elsewhere. I hope that the Task Group composition will resemble more the IARC experts group and not the ICNIRP Main Commission – I hope that ICNIRP gets it. Leszczynski: I am sure many will disagree with whom you consider “the very best scientists”. However, I did not say anything against the quality of the scientific expertise presented by all individual scientists of the past, current and forthcoming Main Commission of ICNIRP. They all are experts in their respective fields of research. What I said is that this group does not represent all valid views and opinions and this will skew the direction of the debate evaluating the scientific evidence. Just the “laws of human nature” will be enough to cause it – “why it is that ICNIRP just doesn’t get it”. This entry was posted in Mobile phones and health and tagged EHC, Environmental Health Criteria, ICNIRP, Main Commission, Mike Repacholi, WHO by dariuszleszczynski. Bookmark the permalink. Well said, Dr. Leszczynski! Real life situations truly totally differ from the ideal….stringent laws may be in place, “sound scientists can discuss the weight of evidence to reach supportable conclusions”…..but in the meantime…..in crowded metros in India (which has adopted the strict ICNIRP norms), things are very different……people live and work at the vicinity of numerous cell phone towers and use their cell phones incessantly…….not everyone can afford to live in less-polluted countrysides amidst orchards………..take for instance this group of employees lunching right under a cell phone tower on their office terrace…. (link below)….any long-term studies to prove this is safe? Can they continue to do this or should they avoid it completely? If there are too many variabilities hindering EMF studies of cell phone towers, more than handsets (as per WHO), how in the first place…..were limits set…….and how accurate are these acceptable limits of SAR/PD distribution……all of them carried out in perfect phantom dummys….in perfect in vivo/in vitro conditions……in state-of-the-art anechoic chambers? If experiments cannot be carried out accurately to simulate real-life conditions due to variabilities, then how are the limits set for real-life situations? On what basis are the numerous positive studies discarded and comparatively lesser negative studies accepted? While we wait for such studies to surface and satisfy one and all, people should be made aware of the safe use of this extremely enabling, omnipresent and soon-to-be invisible technology (thru’ implanted circuitry….perhaps), especially in children and adolescents, and research and researchers, especially the independent researchers, should be encouraged to keep pace with this rapidly-evolving field, the rise of electropollution and its biological impacts should be monitored strictly by every government of every country, through a common methodology. It is ridiculous to compare ICRP to ICNIRP. There is no dispute about ionizing radiation. No obvious conclusion can be drawn from this comparison. Full agreement with Dariusz! Generally – into the process of risk assessment of new technologies and products with unclear side effects (not only of the wireless) are always purposeful co-opted experts, where is supposed a sure guarantee that they will not make problems.in the technology establishment. And it is also the case of EMF risks and the ICNIRP. Outwardly, it appears there are experts “blood-related” through the similar type of thinking and approaches (rigidly “technicist- engineering” and mechanic statistical thinking, not “organic”, not complex biological), who are very useful to achieve the prescribed goal – scientifically “bless” the controversial technology, despite the not fully recognized biological effects. However, I think Michael Repacholi is from the beginning the managing person (the others are only “puppets” due to its appropriate attitude profile) who knew exactly from the industry lobbyists about his assignment – find a scientific arguments for the legal use of the wireless device (mobile phone) with the antenna directly on the head and its radiation intensity in worse conditions about 50 V/m set as a limit for RF EMF (and the same in the ELF area for carrier wave intensity). It is clear that the only applicable model for this purpose was the thermal model of biological effects, that was adapted to the required value by using made-up “safety” coeficients, what gives additionally the impression of responsibility. Mike Repacholi must be either hypocritical or has a great ability to suppress (or rather repress) their consciousness. Meanwhile, protects us relatively from the non-estimable consequences of the ICNIRP limits their non-attainment and paradoxically the EMC conditions. However, if in the future will be shown the many ICNIRP critics were right in contention the limits are not safe, members of the ICNIRP are potential candidates for the dock of law court. The public shouldn’t forget their names, even if they do this undoubtedly mostly with best knowledge and belief. It seems there is still time to remedy. The problem with Repocholi and ICNIRP is that they just follow Swann’s outdated recommendations dating back to the end of WWII, back then radio masts were high, in the middle of fields, not outside bedroom Windows, or transmitters next to you in the same room, exposing the inhabitants to 24/7 exposure, but hold on ICNIRP levels are only valid for six minutes, against heating !. so when Repocholi claims Gerd Oberfeld is doing its citizens a disservice my lowering the limits, because there wont be enough power for 3G, I go with Gerd Oberfeld ever time. I seems Rodney Croft and fellows are coming to the U.K to try and persuade people to take part in a study, why he can’t do it in Australia is a mystery, unless of course the Aussies would tell just him where to go, not only that but he’s enlisted the help of Rubin and Zenon Sienkiewicz, from Public Health England PHE, now if ever there was a contradiction in terms, this is it, Public Health, Rubins, Sienkiewicz, all in the same sentence. so getting back to Rodney Croft, I have seen the letter he touting for his test, the protocols are total nonsense, i feel its another non conclusive, expensive, waste of time that will be quoted by ICNIRP and industry, as proof, that’s if it goes ahead, which i dought. Unfortunately today, there are a greater number of scientists, who realise there’s more money to be made by denying a problem exists, rather than accepting it, after all the offenders have most to gain by keeping the game going, i remember M.Repocholi stating, when asked who funded ICNIRP at a London conference, that they were mostly funded by NGO’s, presumably the wireless industry. “Can the thousands of studies showing harmful effects really all be wrong? Not asking this question ever is the political correctness of this group as presently constituted. Perhaps they substitute a weaker question, I know the WHO does: “How do we adjudicate between positive and negative studies?” – take a “weight of evidence approach”? But this seems to me even, a non-scientist, scientific nonsense and massively lacking in scientific integrity, while the first question mentioned is the one that show how the land lies. That the “laws of human nature” Lesyscyinski mentions play into Repacholis’ hands when he completely ignores the bias he himself introduces by ignoring the first and real question (stated above) is perhaps not uncommon in official and political groups that lie. To be an effective liar one must know how to present an innocent face. One thing I feel is not made explicit in this analysis is the fact that we are sort of dealing with an immune system WALL. The belief that never must be breached is the belief that the microwave-based technologies (mostly) are safe. One instance of their unsafety being shown breaches the wall forever. But in terms of scientific theory there is a massive asymmetry between the position that the technology is safe and unsafe. We should not just consider people being more favourable to studies that show a harmful effect and those that show none. We should also acknowledge this asmmetry: One study – well-conducted and designed and conceived – showing harmful effects means the technology is not safe: but studies not finding a harmful effect do not demonstrate safety because harmful effects could exist still in 1,000s of other untested areas or body systems or scenarios. How do we properly adjudicate between ,”weigh”, “positive” studies “against” “negative” studies? I don’t know if ICNIRP admits to doing this, but I believe The WHO DOES, it takes a “weight of evidence approach”, which seems to me, although I am a non-scientist, to be scientific nonsense, and a massive failure of scientific integrity. So it should surely be enough to have scientists on the committee who have integrity. And we can know they lack integrity is they do not want to address this question, stated above. This is only too familar is it not, from other political groups – where the one thing never mentioned is the very truth that would provide enlightenment and a path to resolve problems ?. The monster protects its integrity (so to speak), so an immune system is created to block reception of the truth that would kill the monster. How do we breach that immune system? Arguing about ICNIRP members is completely irrelevant. What baffles me, is that national Public Health bodies blindly adhere to the *basis* of ICNIRPs guidelines, which effectively voids precaution and the Public Health protection principles that said bodies employ with regard to any other type of exposure. You must be disturbing him. Good job. Never too late to re-evaluate !! And so the spin goes on and on and on…. * at certain levels, can cause chemicals to cross the blood brain barrier in rats. Despite this, Mike Repacholi claims that the ICNIRP Main Commission members are selected for their scientific integrity and their expertise. If this claim is true then the limits ICNIRP recommends can, at best, be regarded as a trade-off between adverse health effects and the convenience of maintaining the ICNIRP guidelines at current levels. Therefore, the ICNIRP limits should not be regarded as safety limits. Why don’t Mike Repacholi and the other ICNIRP, WHO and EU experts get it? Numerous scientific replicated studies show harmful effects well below the obsolete and industry biased ICNIRP limits. Thousands of people are witnessing severe and harmful effects from this radiation and we today se huge increase in typical symptoms and diseases well known since decades to be an effect from radiofrequency radiation. Hundreds of scientists and thousands of medical doctors are raising red warning flags. There is no other explanation for the ICNIRP blinded eyes other than they are paid to be blind. It is a disgrace that they are not held responsible for their recommendations and false reassurances although they have such huge impact on the health of whole populations. There are obvious and well documented huge economic interests in preserving the ICNIRP and the IEEE standards. Mike Repacholi was also paid by industry also while working at the WHO and he arranged the channelling of the money from an Australian hospital. Please have a look at the NRK documentary A radiant day.